The Z270 chipset is the new high-end motherboard platform to go along with Intel’s new Kaby Lake processors, like the top-spec Core i7 7700K. 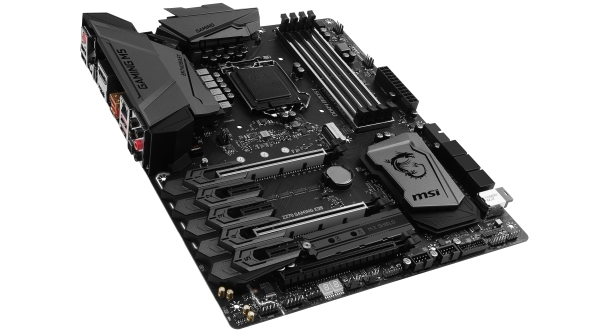 MSI’s mid-range ~$185 (£180) Z270 Gaming M5 sits alongside approximately 50,000 other 200-series motherboards in their new lineup and represents our first taste of Intel’s new chipset. Read more: the best CPU for gaming. The motherboard is often regarded as a bit of an afterthought when you’re speccing out a new PC build. The graphics card and processor are usually the places where the big money gets spent (with maybe an SSD following up closely behind) but the motherboard, the backbone of your rig, is sometimes little more than an afterthought. 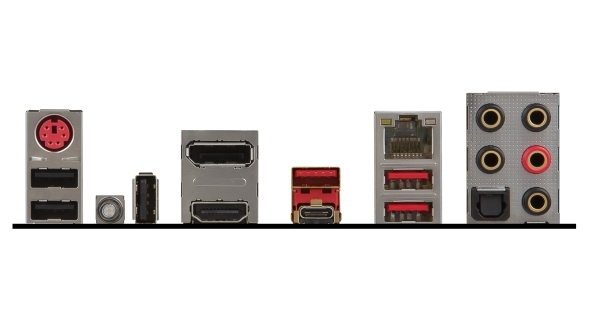 With the new platform range MSI are hoping to convince you their boards are the difference makers and should form the base of your next machine. But how much difference can a motherboard really make in these days where the CPU and GPU hold so much sway? Before we get too far into the specifics about the mid-range MSI board itself it’s probably worth taking a look at what the new Z270 chipset is all about. It’s essentially been introduced to try and give the new Kaby Lake range of mildly optimised processors the feel of a whole new platform. In reality we’re talking about a set of CPUs which are practically identical to the last generation, and so it won’t be much of a surprise that there’s precious little changed with the shift from last-gen 100-series chipsets to the new 200-series. For a start they’re both mutually compatible thanks to utilising the same LGA 1151 socket so they can both take Skylake and Kaby Lake processors. There’s been no change in memory support either, so we’re still looking at dual-channel DDR4, with chipset compatibility for DDR3L if mobo manufacturers want to go down that route. Where there are differences though it’s because of the rise of solid state storage being tied into your system’s available PCIe lanes. The Z270 sees a boost from twenty lanes on the Z170 chipset to a maximum of 24 PCIe lanes, so if you’re looking to fill out your system with multiple graphics cards and PCIe-based SSDs you’re not going to be quite so pushed for bandwidth. Intel have also introduced RAID support for PCIe SSDs too, which promises to provide some seriously speedy storage. 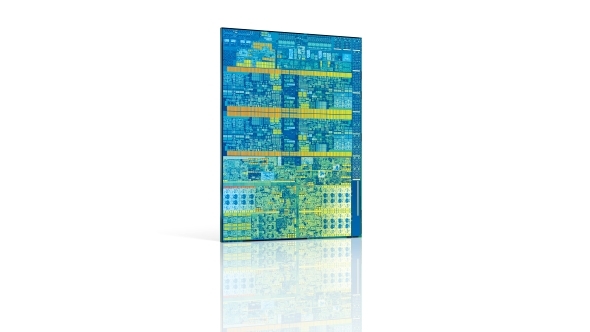 The 200-series chipsets also provide support for Intel’s upcoming Optane technology. Optane is going to first arrive as an M.2 SSD, but there are meant to be modules on the way which will act as a sort of hybrid system memory, offering the possibility of effectively having exponentially more RAM in your rig. 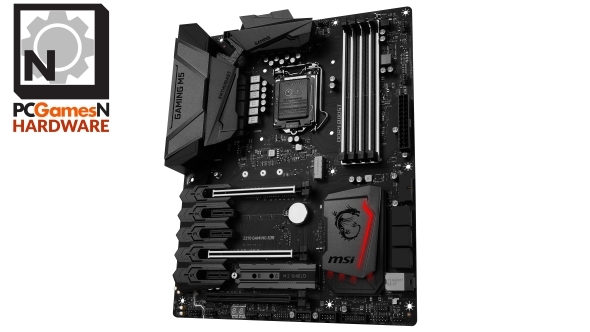 This specific Z270 Gaming M5 board from MSI comes with a mid-range specs list to go along with its relatively reasonable ~$185 (£180) price point. Unfortunately pricing is pretty vague at the moment, but we’ve heard there will be a slight mark up over the equivalent 100-series boards. The Gaming M5, as the name might suggest, is designed for gamers to hit upon a decent feature list without breaking the bank on a host of unnecessary LN2 overclocking points. It still has support for both three-way AMD and two-way Nvidia multi-GPU implementations as well as a pair of M.2 sockets on the board for your speedy SSD storage. One of those sockets comes with what MSI are calling an M.2 Shield. The bare PCIe-based SSDs can get incredibly hot and that can throttle performance, something which happened a lot with Samsung’s last-gen 950 SSDs. The M.2 Shield has a thermal pad on the underside to draw heat away from the storage silicon and is designed to keep things a little more chilled. MSI have also reinforced the DIMM, PCIe and M.2 slots with a feature they call Steel Armor. It’s designed to make the individual contact points more sturdy, something that’s most welcome on the two main x16 PCIe 3.0 slots for graphics cards. When the board is mounted in a tower chassis the weight of modern graphics cards can put a lot of pressure on the PCIe socket and anything which gives that a little extra strength is always appreciated. 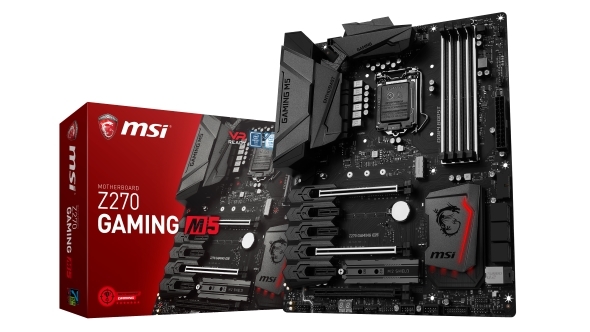 MSI have added more of their own bespoke touches to the Gaming M5 too, like the adjustable RGB LED lighting on the board, a dedicated header to control the rest of your system’s connected RGB LEDs (that screams gaming, right?) and a dedicated VR USB port to help ensure a strong signal along the full length of the cabling to your headset of choice. They’ve also isolated their Audio Boost 4 onboard sound to prevent any electrical disruption taking place and to deliver high-quality game audio without the need for a dedicated sound card. It’s a motherboard designed for fire-and-forget installation, so there are no onboard controls for overclocking or big red power/reset switches. When it comes to straight CPU performance the mid-range MSI board just about took the win in both our Cinebench rendering and X264 v5 encoding benchmarks. That’s not bad when you compare it to the vastly more expensive Z170 ROG board and the higher-end Asus TUF Z270 we tested it against. In the DX12-based 3DMark Time Spy test the Gaming M5 also came out on top in the CPU stakes and won the day with the more all-encompassing Firestrike benchmark. When it comes to actual gaming benchmarks though the differences are harder to see. The greatest variance comes with the Vulkan-based Doom test, where the MSI board comes in last of the four comparison boards. The MSI is also a little behind on the storage performance tests too, with the Samsung 960 EVO 1TB giving an idea of base performance. It’s also interesting that the Gaming M5 is the most power hungry, and therefore gets the CPU the most hot under the collar. And when we’re talking thermals it’s worth mentioning that M.2 Shield. We did notice some slight improvements over a short SSD test between a bare Samsung 960 EVO and with the shielding in place, but over an extended test we still hit the same 67°C whether the MSI M.2 Shield was in place or not. But what does need to be said though is that the performance differences between even the super high-end Z170 and the cheapest Z270 we’ve tested are minimal at best. We hit a stable 4.9GHz with our Core i7 7700K sample and could boot and partially run at over 5GHz on all the boards. The Z270 represents the top PC gaming motherboard platform around right now. If you’re looking to buy a new machine then this is where you should be spending your money. But if you’re trying to decide if there’s any need to upgrade from your Z170 board then keep your wallet in your pocket – there’s precious little here for you. The performance difference between the two generations is so minimal it could be swept away as the results of expected variances in testing. The same is more or less true between the different Z270 boards we’ve tested too. That’s not a great surprise given how much of a known quantity the technology at play is and how much the performance of your PC is governed by the CPU and GPU silicon rather than any other of its constituent components. So much is built into the processor now the motherboard chipset doesn’t really have a lot to do on its own. So it really comes down to price and feature sets and that’s where the MSI Gaming M5 has got a great head-start. MSI have jammed a host of its own niche little features into this well-priced board, giving you pretty much all an average gamer would need, with a modicum of enthusiast overclocking support if you want to push things further later on. 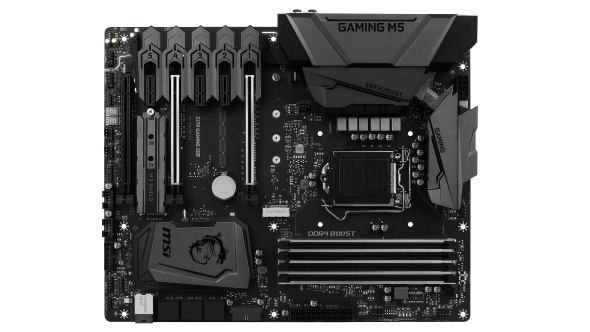 The backpanel is a little sparse and the extra power draw and peak temperature over the Asus boards is a bit of a shame, but the MSI Z270 Gaming M5 is a quality board for your new rig whether you’re going for a new Kaby Lake CPU or sticking with Skylake.